This bundle comes with EIGHT products to make your weeks back into school a breeze. Please click each of these products to see exactly what you're getting. -In this pack, you will find several activities to help teach and reinforce rules and procedures for your classroom. The pack starts off with 5 basic rules that can be used in most classrooms. Following those 5 rules, there is a whole group sort to teach good and poor choices, printables, mini books, and writing sheets. -Capture memories from the beginning of the year, as well as outline and introduce rules and procedures for the classroom. 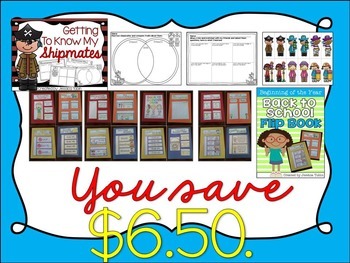 This beginning of the year flip book comes with 17 interactive pages that you will pick and choose from for your classroom. And throughout the course of the first week of school, you'll do a few pages here and there until their back to school book is completed. 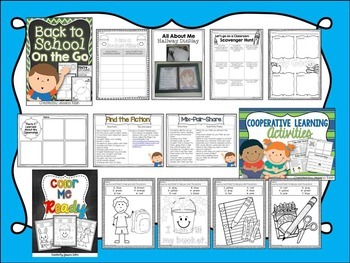 --In this pack, you will find Kagan Cooperative Learning lessons and activities for students to do within the first week of school to get to know their classmates. 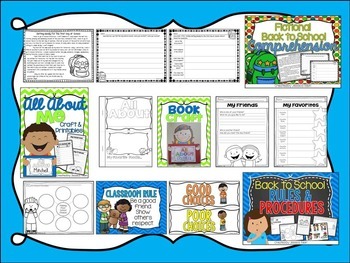 -There are two sets of printables in this beginning of the year set. There is a set of forms for your Open House, a set of fun printables for the kids, and 2 get to know you crafts. -In this product, you will find 5 stories with 2 comprehension activities for each. One of the back to school comprehension papers deals with answering questions about the text and the other paper deals with writing a response based off the passage. 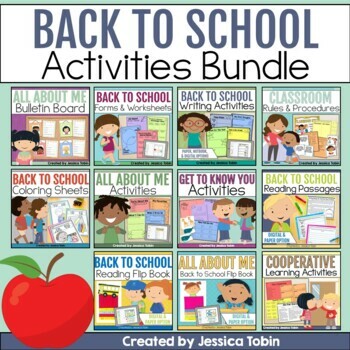 -These Beginning of the Year activities will help students to know each other and learn interesting information about their classmates during the back to school transition. -This all about me craft with make your kids love to write all about themselves and their new friends. Inside, you'll find a mini book with a craft for students to write about themselves. You'll also find printables for print and go fun for the beginning of the year! -This product is a fun Back to School activity pack with 10 coloring sheets. Students are required to color by number in these sheets. Images range from school buses to school kids to classroom desks.